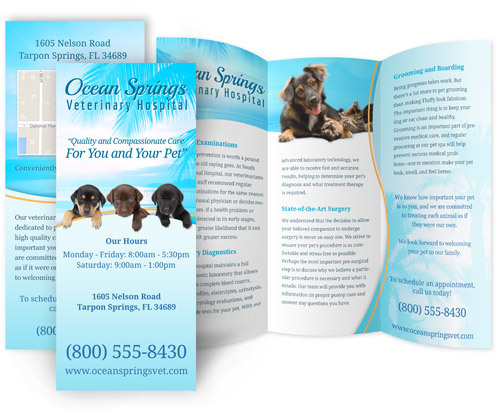 You want a brochure for your veterinary hospital but haven't had the time to write or design one. You're concerned about hiring a marketing or design company to create one for you. They don't understand the special nature of your practice and the benefits that only you can offer to local pet owners. VetNetwork has the expertise and experience to create a compelling brochure that reflects your practice’s personality and exceptional qualities. Our company is owned and managed by a veterinarian with more than 20 years of veterinary hospital ownership experience – which means that our creative team benefits from a unique, insider’s view of catering to veterinary hospital clients. In short, we know precisely what it takes to craft a message that demonstrates to local pet owners why your practice is the only hospital they should call for pet services. 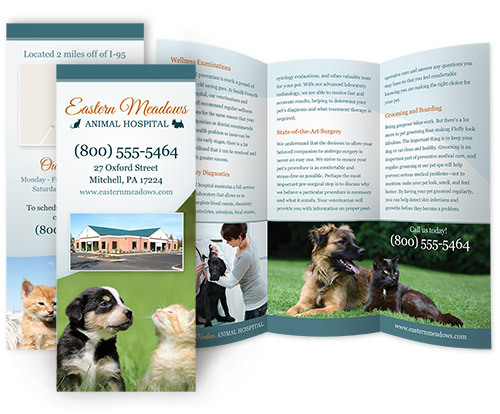 Even in today's technology-driven world, don't underestimate the value of a colorful, interesting and professionally designed brochure for attracting new clients to your veterinary hospital. VetNetwork will create a high-quality brochure for your practice that provides current and prospective clients with a compelling glimpse of who you are and how you can help them. After reading your hospital's brochure, prospective clients who want the best for their pets will ask for more information, view your website or call for an appointment. Choose from one of the designs above and we'll create your custom brochure for only $1,400. We do all the work; this includes writing your text, photo manipulation and editing. Content, photos, text and your logo are customized to fit your hospital’s message. You also choose the colors. Low-priced printing is available. Call today at 603-743-4321 and your new veterinary hospital brochures will be delivered to your practice within two weeks. Why wait? For a one-of-a-kind brochure that is totally unique to your hospital, please call our studio for pricing. You can see some examples on the Brochure Portfolio Page. Creating your unique brochure is much less expensive than you think. 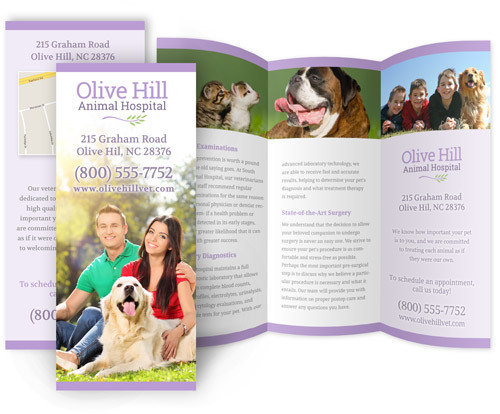 A brochure gets your name out there and pitches your veterinary hospital's services when you aren't around. 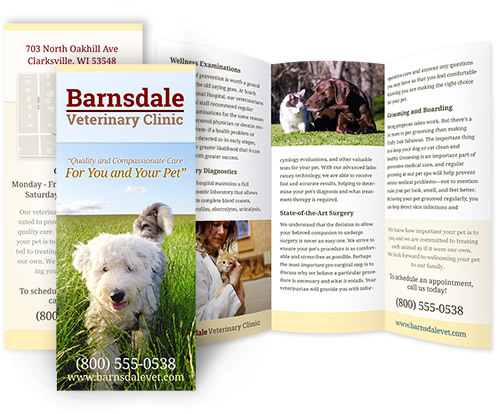 Brochures can be mailed, included in welcome packs, and placed in multiple locations to draw clients to your veterinary hospital. Put veterinary brochures in an obvious location in your hospital's waiting area and include them with your welcome packets and invoices. Consider placing your brochures at local businesses, the chamber of commerce, pet supply stores, boarding kennels, the local SPCA, and regional dog and cat shows. 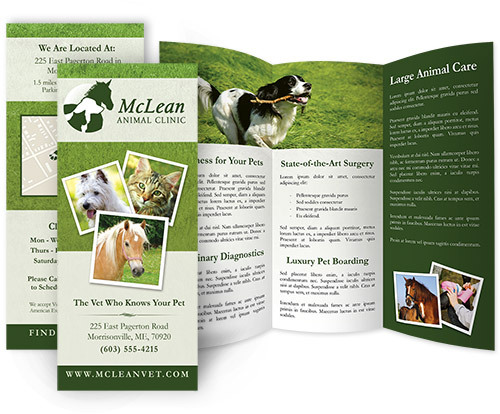 Bring your veterinary brochures to local events and hand them out whenever you give a talk. Your custom veterinary hospital brochure, created by the experts at VetNetwork, acts as a reference for clients and is used to refer friends and local pet owners to your practice. However, a veterinary brochure developed by a company that doesn't understand your message only diminishes your practice's credibility. 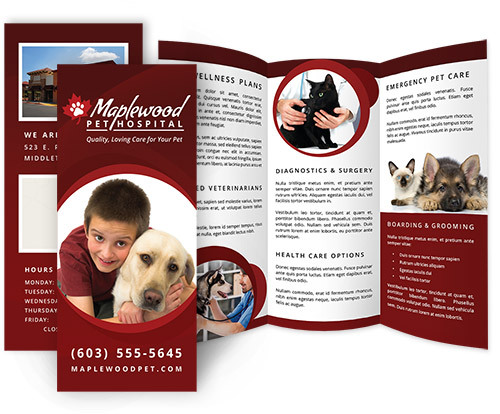 We know how to craft your custom brochure that resonates with pet owners and promotes the benefits of your veterinary practice, and then package it within an attractive, compelling and well-executed design. VetNetwork can offer you something no other marketing services company can: exclusive dedication to veterinary hospitals and a real understanding of what pet owners (your clients) want. We know how to craft the message that will draw local pet owners to your hospital. VetNetwork is more than just a service provider; we are an extension of your team. Ready for your brochure? Why wait any longer? Call today: 603-743-4321.